The Medical College Admissions Exam (MCAT) is a standardized, multiple-choice examination designed to assess students’ problem solving, critical thinking, and knowledge of concepts that are prerequisites to the study of medicine. All US medical schools require applicants to submit MCAT exam scores (most schools only consider scores that are no more than 3 years old). Please read through our resources below and make sure you are prepared to study for and take the MCAT before registering. 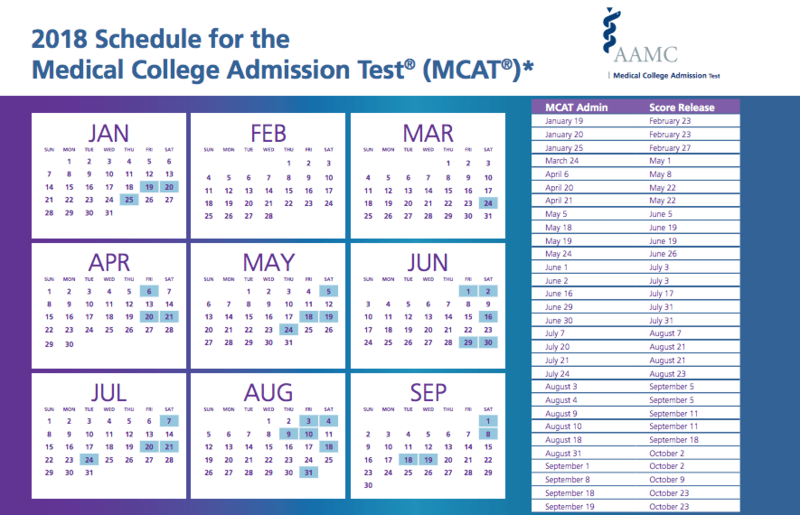 Once you have a date in mind, you can find a testing location near you and register for the MCAT through the AAMC registration service. Before reading below, if you are a UH student, please consider applying for the semesterly ASUH test prep scholarship! Where can I learn more about the MCAT? Where should I start? The UH Manoa Pre-Health Advising Center has provided a nice brief MCAT overview. The non-profit site GoGrad.Org, also provides a very comprehensive overview of the MCAT and what you should consider if you would like to succeed. The AAMC has also provided a Full Website and FAQ Page dedicated to answering your questions about the MCAT. How is the old MCAT different from the current MCAT? The natural sciences sections of the MCAT 2015 exam reflect new knowledge and recent changes in medical education, such as the fact that some biochemistry knowledge is helpful at entry to medical school. The new exam includes a section on the social and behavioral sciences: Psychological, Social and Biological Foundations of Behavior. The significance of this new section lies in its recognition of the crucial role that sociocultural and behavioral determinants play in our health and health outcomes. The new Critical Analysis and Reasoning Skills section tests students’ analysis, evaluation, and reasoning skills. While the current Verbal Reasoning section includes passages from the natural sciences and technology, the new Critical Analysis and Reasoning Skills section does not. It draws on passages from the social sciences and humanities disciplines, including passages from ethics, philosophy, studies of diverse cultures, and population health. No specific knowledge from these disciplines is required to do well on this section. The Writing Sample section was discontinued after 2012. The current MCAT costs more. Registration costs have been raised by $40, yielding total cost of $315 for each administration. When should I register for the MCAT? When are scores released? Before registering, consider reading AAMC’s Test Day and Security Page and the MCAT Essentials for 2018. Exam dates, registration deadlines, and score release dates for the current MCAT can be found on the AAMC MCAT Registration Website. For more information on the registration fees broken down by zones, see our “How much does it cost to register for the MCAT?” FAQ tab. Also be sure to check for seat availability by finding a testing center near your location and registering through the AAMC MCAT Registration Service. How much does it cost to register for the MCAT? What other fees are there? Currently, the registration fee for the MCAT is dependent on how early from your test date you register for the exam. These time frames are categorized into “zones”. Bronze Zone = 8 days prior to your planned exam date. If you register for the MCAT during the Gold or Silver Zone, the registration fee is $315. If you register during the Bronze Zone, this fee increases to $370. Depending on your Zone, subsequent fees for rescheduling and cancellation will vary as well. ADVICE: Overall, if possible, it seems most beneficial to register during the Gold Zone. Not only are registration fees cheaper, but rescheduling fees are the cheapest as well (price is doubled in Silver Zone, rescheduling is not even an option in Bronze Zone) and you have the option to cancel the exam if needed (this is not a possibility for those that register during Silver or Bronze Zone). I can’t afford to register for the MCAT. What should I do? The AAMC believes that the costs of applying to medical school should not be a barrier to individuals that have are interested in becoming physicians. If you are eligible for the AAMC Fee Assistance Program, part of their benefits include reduced registration fees for the MCAT. Can’t afford your test prep materials? Consider applying for the ASUH test prep scholarship! Just cant afford medical school applications in general? Visit the AAMC Medical School Financial Aid Website and watch this webinar on affording the MCAT, application process and your medical school journey. How Do I Prepare for the MCAT? What courses are needed? Before planning out your MCAT, be sure to review the AAMC’s MCAT Preparation Page and MCAT Essentials for 2018. The GoGrad.org MCAT Guidebook also provides great general advice on MCAT preparations and considerations. 1. Studying hard for your courses (see below): The best way to prepare for the MCAT is by studying hard (and doing well in) your required/recommended pre-med/MCAT coursework (below). Lay a good foundation for yourself so that studying for the MCAT is more like a review of the courses youve already taken. While cramming may work for your individual courses, it is not a good way of truly learning the material. 2. LOTS of practice exams/sample questions (see FAQ on practice exams for more info): we cannot emphasize enough the importance of taking regular practice exams/sample questions to test your knowledge, identify areas of strength or weakness, and to give yourself as many data points as possible in predicting your actual test-day score. Sample questions and practice exams are also a good way of learning how the MCAT will ask questions and teaching yourself how to think about the questions in the right way. Practice exams should be a major part of your study plan. 3. Review books/resources (see FAQ on Books and Other Resources): we generally do not recommend trying to re-read your textbooks from your pre-requisite courses in preparing for the MCAT. You should have ideally read through any textbooks during the course itself. Either way, when studying for the MCAT, read books or other online resources that are specifically geared towards prepping you for the MCAT exam. Your textbooks may not have the same focus. 4. MCAT Courses/Study Schedules (See FAQs on MCAT Courses and Study Schedules for more info): When preparing for the MCAT, you should have a plan of attack. We cannot recommend that you take any specific courses for the MCAT, but these courses are (for certain individuals) a good way of giving yourself structure and study strategies in your preparation process. If you don’t feel a course is right for you (which for many students it isn’t), you should still set a schedule for yourself and have some idea how you will approach learning the material. 5. Talk to People! : Talking to your MSMP mentor or other people you know did well on the MCAT may be a good way to start in thinking about your MCAT strategy, study/practice test schedule, purchased books, preparation coursework, etc. You do NOT want to copy anyone’s study plan, but you should seek to emulate the best aspects of different individuals’ approaches, and in doing so, find what works best for you. If you are from UH, a list of the suggested coursework can be found in the UHM PAC 2017 MCAT overview. Are there practice exams available for the MCAT? How important are practice exams? How many should I take? Taking practice exams and doing sample questions are a great idea as they allow you to familiarize yourself with a computer-based test (CBT), understand the formatting of the exam, and provide a diagnostic for your existing knowledge base. Sample questions and practice exams are also a good way of learning how the MCAT will frame its questions and how you should approach answering them. The MCAT is a unique exam and probably unlike any exam you will have taken in your undergraduate course work. It is very important to become familiar with the test through practice questions and exams. What practice exams are available? First of all, please be sure to check out the Official AAMC Online Practice Exam and Question Bank Resource Page. Kaplan‘s full boxed sets and books often come with bundled practice tests. Their courses ($2000+) also come with practice exams as part of the package. How many exams should I take? There isn’t an exact number we can officially recommend you take. However, keep in mind that the more data points you have (ie the more tests you take), the better you will be able to predict your actual score (keeping in mind that the stress of the actual test may lower your predicted score slightly). This usually means taking a diagnostic exam at the beginning of your study period, 1-2 close to the midpoint of your studying, and a couple to a few more towards the end of your study period. The end of your study period usually means the few weeks prior to your exam. It is likely inadvisable to take a practice test the day before (or even a couple days before) your exam. On a similar note, you do not want to burn out, so do not take the practice exams too close together (give yourself some at least a few days to a week to breathe between exams). You should ideally also have time to study between exams so that you can reassess and improve each time you take a practice test. Doing sample questions (not necessarily full length exams) between practice tests is a good idea to help you learn the material/question format and assess your knowledge at the same time. What if my practice exam scores aren’t good? If you are not getting a competitive score in the week or two leading up to your actual exam, it may not be a good idea to take your scheduled exam yet. If you are consistently not doing well on practice exams in the weeks prior to your exam, or if you are getting inconsistent scores, you should highly consider rescheduling your exam for when you are more ready. That being said, do not cancel your exam because you had a bad day, or got one less than desirable score on a practice test. Again this is where more data points (ie more practice exams) can help you make a better informed decision. Aside from practice MCAT exams, are there any other self-assessments or practice question sets available? Various test prep companies offer study packages and test prep books which may include sample passages. Some common companies are Kaplan, The Princeton Review, Berkeley Review, and Examkrackers. These companies should sell books which either focus on sample passages or include sample passages. You should research and talk with friends and mentors about which books may be right for you. In particular, Examkrackers sells a series of question bank books which focus solely on sample passages in the MCAT. I’ve heard there are courses that can help me prepare for the MCAT. Are these required? What are my options? While not necessary to do well on the MCAT, preparatory courses are beneficial if you need a more structured environment that will keep you motivated and disciplined. There are a plethora of different test preparation companies, but mainstream options available in Hawaii include Kaplan and Princeton Review. Because these courses can be costly, if you are in need of financial assistance, be sure to look into scholarship programs provided by these companies. If you cannot afford a course, consider applying for the ASUH test prep scholarships. Khan Academy offers free MCAT-specific videos as well as free basic science videos that cover specific topics in all areas of the MCAT. ExamKrackers offers an online course for students in Hawaii. Course Savers provides subscription-based access to lecture videos taught by Chad, who specializes in teaching pre-health students basic science concepts that are tested on the MCAT. Next Step provides a 1-1 tutor service for the MCAT. This program is a bit newer, but you can see if it is something you are interested in. MCAT for Me is a free MCAT study program that offers different schedules (2-month, 3-month, 6-month) and other resources such as videos and flashcards. Dr. Flower’s Review is a newer (and perhaps less-tested) online test prep program. They offer some more affordable options. What books or other resources should I use to prepare for the MCAT? To optimize your studying for the MCAT, you should consider investing in MCAT-specific books rather than studying from textbooks from your undergraduate courses. These books often include content review, numerous passages formatted similarly to the exam, and many practice questions to help you solidify your knowledge. The same companies that offer test preparatory courses (Kaplan and Princeton Review) also sell MCAT preparatory books. Examkrakers sells a Complete Study Package that provides a good overview of the material tested on the MCAT, along with passages to test your understanding. They also sell various books specializing in providing practice questions and passages for each test section. Berkeley Review offers a home-study set of books that include detailed content review, numerous MCAT-style passages and test questions for biology, chemistry, organic chemistry, and physics. The AAMC Psychology/Sociology Textbook Resource is a good place to start in looking for resources in preparing for the humanities section of the MCAT. The Student Doctor Network (note that this just one thread in SDN, it may be a good idea to look into other related threads and chat with your classmates and mentor(s) to see what may work best for you). I’ve decided to do a home-study MCAT plan. How should I set up my study schedule? If you choose not to invest in an MCAT course, we strongly advise you to set up an MCAT study schedule for yourself. Assuming you are using some of the preparatory books mentioned in this FAQ, we have listed some pre-made schedules you can consider. No matter what, please consider visiting the official AAMC MCAT Preparation Page and Study Plan Creation Guide. ADVICE: There is no need to limit yourself to any of the schedules. Only you can determine your own pace and how strictly you can adhere to these schedules. But they are here to provide a framework and give you an idea of what an MCAT study schedule can look like! ExamKrackers offers a home-study schedule for those that are using their materials. SN2ed 3-month schedule, which can be also be modified to be 4 months if needed. You can use MCAT.me or CramFighter to help you keep track of your study schedule. I just got my MCAT score back, but I am not feeling satisfied with my score. Should I retake my MCAT? Because every person’s situation is a bit different, we strongly advise that you stop by at the UH Pre-Health Advising Center (PAC) to speak to a pre-med advisor, who will help you evaluate whether or not an MCAT retake would be beneficial with the rest of your application in consideration. You should also read the AAMC report on how Medical Schools across the country use the MCAT in making their acceptance decisions. Also consider seeing where you fall on the MCAT Scoring system (in terms of percentile rank). The AAMC publishes the distribution of MCAT scores for all test takers each year. To see where you stand, compared to others, you can check out the distributions for the months of May 2018 to April 2019. Took the old MCAT? You can check out the distributions for January 2012 to November 2014. Columbia University: Should I retake the MCAT? Harvard University: Should I retake the MCAT? Will I be able to change my score drastically if I retake my MCAT? To determine how much you can change your score, you need to take some time to self-reflect and consider areas that you could possibly improve on. Were you using the appropriate materials to study for the MCAT? Did you follow a study schedule? Did you give yourself enough time to study and prepare for the exam? Did your scores reflect a weakness in your understanding of certain material? These are all important questions you should be asking yourself so that you can determine what you should change and improve, if you were to consider retaking the MCAT. These statistics only provide an average distribution of how much retakers improved their scores. Ultimately, it will be up to the changes you make in your approach to studying for the MCAT that can lead to significant improvements in your score.